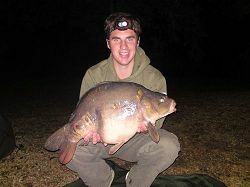 Ben with a 16lb mirror. Ben with an 18lb mirror. A friend (Ben Davis) and I fished from Tuesday 1st to Friday 4th September. Upon arriving at the lake we were pleased to find it not to busy and had a good choice of swims, eventually choosing one at the windward end of the lake but on the side without the pontoons as this seemed far less pressured. On the first night having turned up late in the afternoon we both fished with small PVA bags at between 50 & 80ish yards. Despite being told that the fishing was a bit slow at the moment, we immediatley both were getting infrequent line bites but nothing materialised until about 3am on Wednesday when Ben landed the first fish of the trip, a tench of approximatley 5Ib. Throughout our visit everything was very quiet in the days with all the fish coming between midnight and 7am. On Wednesday morning we found a number of features to fish to, choosing both gravel and silt features at between 70 and 80 yards and another rod where the margin shelved off to about 7ft deep. 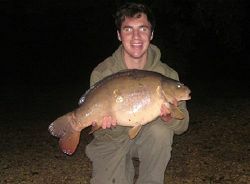 Having chosen the spots we both spodded out various mixes of particles, chopped boilies and a generous amount of hemp. As we were using oily spod mix immediatley after putting out the bait the hemp creates a flat slick until it settles on the bottom. When sitting out at about midnight on Wednesday night there was a full moon and the water in front of us suddenly when totally flat, the carp had found our bait and were obviously creating quite a stir, hopefuly the sign of things to come. At about 12.30 Ben's right hand rod rattled off; after a good fight the first carp was landed a mirror weighing in at 18 and a half pounds caught on a Nash Scopex Squid boilie. This was followed at about 5.30am with his left rod taking off, this time resulting in another mirror at 16Ib caught on two pieces of plastic corn. It turned out to be a fantastic and very memorable 3 nights on Oxlease, which despite the 2007 floods still lives up to its old reputation thanks to you guys.